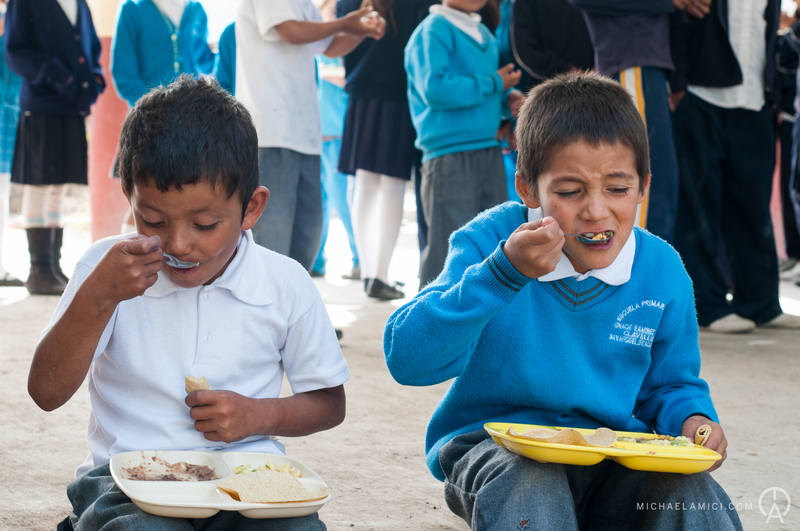 Every day, thousands of children from the poorest communities in Mexico go to bed hungry. Give today to help us break the devastating cycle of poverty and hunger. During the 2018-2019 school year, Feed the Hungry San Miguel will provide more than ONE MILLION hot, nutritious school meals. Yet the need remains great. In the central highlands of Mexico, scattered around the historic old city of San Miguel de Allende, there are more than 500 communities where the typical family has an average annual income of less than $2,000 US dollars. Many of these communities have limited access to electricity and clean, running water. In this type of desperately poor environment, children often go to bed hungry and do not go to school on a regular basis. With your help, Feed the Hungry San Miguel makes meaningful changes in the lives of these unfortunate children by establishing and operating school kitchens in as many communities as possible. Today, Feed the Hungry feeds nearly 5,000 children a nutritious meal each and every school day, but the children must attend school to receive it. Attendance rates and test grades go up significantly after Feed the Hungry San Miguel opens a school kitchen. Nutritious meals help children concentrate so that they can learn. For many children, this school lunch is their only meal of the day. There are currently 37 schools and 7 charities that receive support from Feed the Hungry San Miguel, thanks to your generosity. You can make a difference in the lives of even more children. Contact us if you would like to set up donations direct from your bank or if you are interested in including Feed the Hungry San Miguel in your estate plans. Bertolt Brecht said it in 1929: “First feed the face. Then talk right and wrong."